Could Amazon actually win the race to build the most widely-used AI voice platform? As unlikely as it sounds, Amazon is pushing far harder than Microsoft or Apple to get its technology into the hands of other companies. Today, Amazon said it would make Alexa—the voice-controlled assistant that sits inside its Echo hardware—free to any developers who want to use the software in their third-party devices. Not only is Alexa now free to use for other companies through an SDK skills kit though; she’s also the subject of a new $100 million investment fund Amazon announced today, aimed at investing in companies that are building voice technology. 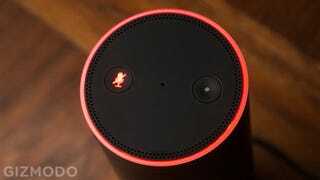 In other words, Amazon wants to win the voice-controlled UI game–and it’s putting a considerable amount of money and free software behind smaller companies that want to collaborate. In today’s press release, we learn that the investment fund already has seven recipients, and they give us a little glimpse at how broadly voice-control could go (if it’s good!). There’s an app called Orange Chef that can answer questions about recipes or techniques in the kitchen. A garage door monitoring system that will let users ask Alexa if they left the door open. A toy company that lets a parent “speak” through a connected toy. Cars, exercise, security systems—another notable partner is Dragon, which works with entrepreneurs and inventors on emerging products, and will theoretically be helping its clients integrate Alexa into their work. It’s a smart move from a company that’s done a surprisingly good job with a complicated piece of hardware. While other voice AI remains in walled gardens, Alexa is now free to roam.